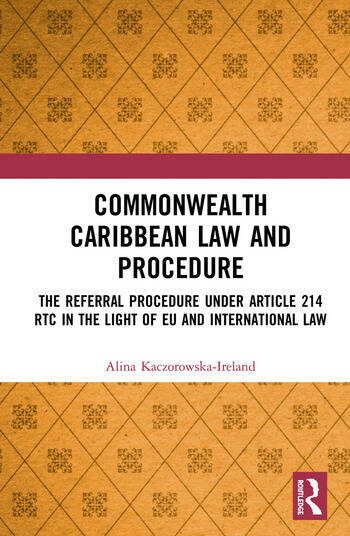 Commonwealth Caribbean Law and Procedure: the Referral Procedure under Article 214 RTC in the Light of EU and International Law is about the referral procedure set out in Article 214 of the Revised Treaty of Chaguaramas (RTC), which Treaty established the Caribbean Community Single Market and Economy (CSME). Article 214 RTC bears clear parallels to Article 267 of the Treaty on the Functioning of the European Union (TFEU) the most important being that both articles pursue the same objective, i.e. they seek to ensure that CSME law and EU law, respectively, are uniformly applied in all Member States. Although Article 214 RTC was inspired by, and modelled on, Article 267 TFEU, it is not its exact replica. The similarities and differences between Article 214 RTC and Article 267 TFEU are critically assessed in this book. • Examines how Article 214 RTC operates in the Caribbean context, how it interacts with other provisions of the RTC, and how it fits into the various national legal systems of the Member States of CSME. • Explores possible reasons why, so far, national courts of the Member States of CSME have not made any referrals to the Caribbean Court of Justice (CCJ). • Puts Article 214 RTC in a comparative perspective, in particular, compares and contrasts it with Article 267 TFEU. • Examines some of the aspects of Article 214 RTC in the light of public international law bearing in mind that under Article 217(1) RTC the CCJ is required, when exercising its original jurisdiction under Article 211 RTC, to "apply such rules of international law as may be applicable". This is to ensure that the CCJ will not bring in a finding of non liquet on the ground of silence or obscurity of CSME law which Article 217(2) RTC expressly prohibits. This book will be of interest to academics and students studying CSME law, EU law, and comparative law, as well as judges, lawyers, governmental and non-governmental organisations from the Caribbean region. Alina Kaczorowska-Ireland is Professor of International and EU Law at the University of the West Indies, Cave Hill Campus, Barbados. She is also the author of the Routledge textbooks European Union Law, Public International Law and Competition Law in the Caribbean Common Market and Economy.